I love cashews. 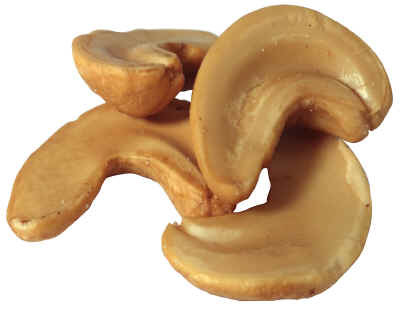 Unlike other nuts of various kinds, however, you can never buy a cashew in its shell. This has perplexed me for years. Turns out, there is some kind of oil that surrounds the shell of a cashew that is very irritating to human skin. I didn’t realize that cashews are in the same plant family as poison ivy! Go figure. Thus, harvesting cashews would be nasty work. But why, you ask, are they not roasted? Turns out roasting the shells creates a nasty and noxious smoke. So no one would even bother. Any other information about cashews, you ask? Yes! Cashews help to prevent tooth decay. There is some kind of oil in the cashew that is really powerful, and stops the growth of bacteria that produces plaque. This entry was posted in Food/Beverage, Who Knew?. Bookmark the permalink. Love cashews…but now…eeewww! Funny story, actually. Just shows how amazing a food they are. I love that there is something so beneficial wrapped in something so noxious. It is a great lesson for life.